Inside São Paulo: Free Your Closet!!! Free Your Closet is a proposal for a shared recycling of women closets tuned with the new forms of responsible consumption. It is a one-day event in a cool place to meet women who want to sell their used clothing but still in perfect condition and thrift store prices! Those interested should send digital photos of five examples of clothing worn by themselves by email. 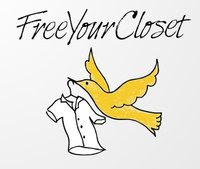 Free Your Closet will review the proposals and will select the participants according to criteria of quality and appropriateness to the target audience, emphasizing the diversity of styles and sizes. A list of the selected people will be published on the blog. Those selected will receive a confirmation email with the Participation Form that must be completed and returned by the stipulated date. On Sunday of the event, the seller will arrive at the venue with her products with three hours in advance. From the 8 pm there will be a change of clothes between participants who still have products available and the closing party of the Free Your Closet event. Keep following their website to take part to the next events as a participant and go on Sunday to check out the 1st edition of Free Your Closet!